In 2019 Camp Ihduhapi celebrates 90 years! It’s been 90 years since the founding of Camp Ihduhapi on Lake Independence. We are a strong community that spans generations. Join Camp Ihduhapi in celebrating 90 years throughout the entire year! Saturday, May 18 | 9:30 a.m. - 3:30 p.m.
Sunday, June 2 | 1 - 4 p.m.
Post and follow formal and informal 90th events throughout the year on social media at #ihduhapi90. Sunday, June 2; 1 – 4 p.m.
Take a tour of Camp Ihduhapi, meet the summer staff, let our staff answer your questions and get a glimpse of what your child will experience at camp. We look forward to seeing you! Registration not required. Hello! 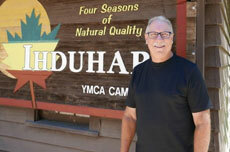 My name is Eric Sundell, and I am a volunteer with the YMCA Camp Ihduhapi Community Board. We are a dedicated group who work with Ihduhapi's camp staff on all aspects of the programs, facilities, and community of our camping participants. My first experience with Ihduhapi was in 1980 as part of a parent/ child program called "Y Guides." Over the years I was a summer camper not only at Ihduhapi, but many other YMCA camps as well. In 1991 I started working for the YMCA and from 1997 to 2002, I was a year round staff member at Ihduhapi. Both of my kids (Ages 12 & 15) have attended Ihduhapi, participating in day and overnight camping programs. The experiences and memories we all have from Ihduhapi are held close to our hearts. Over this past summer, our family had the pleasure of hosting Jorge, a new summer camper who came all the way from Madrid, Spain. When Jorge was not at Ihduhapi enjoying all that camp has to offer, he would stay with our family over the weekend breaks. We were excited to share our culture and all the awesome things to do and see here in Minnesota, including taking in a Minnesota United game. Jorge made incredible life-long friendships and participated in new experiences, which will forever be cherished. Jorge would always talk about the new friends he made with both campers and staff. We are excited to see Jorge soon, as he would like to come back to Ihduhapi again. During the summer of 2018, outdoor cooking was not offered as an achievement, gasp! However, campers still had the opportunity to participate in hands-on, outdoor cooking during their cook-out/overnight experiences. As a cabin group, campers chose what to prepare for their meals, collected the necessary ingredients and cookware, and headed to their designated campsite. Here they learned various fire-building techniques, the principles of Leave-No-Trace, and worked together to prepare and enjoy their meal. We’ve experimented with various meals over the years, and it seems as though Goulash and Chaco-Tacos always rank the highest! Additionally, in our new-and-improved Farm Achievement, campers spent time learning about and caring for pygmy goats, chickens, and a bunny. They also tended to the new Camp Ihduhapi garden, enjoying fresh fruit, vegetables, and herbs. A Caprese salad created by campers was among the top garden-inspired recipes. We’re excited about the farm program growing and teaching appreciation of nature and farm-to-table concepts, stewardship, patience, and responsibility. Camp doesn’t stop at Camp Ihduhapi when the season changes. We have hosted two weddings, invited large school groups out for high-ropes and team building, and are excited to have three schools visit camp for outdoor education activities this fall. We are excited to teach courses in energy choices, outdoor survival, life cycle, and native cultures to partner schools from Orono, Saint Louis Park, and New Prague. As the maple leaves change from green to autumnal oranges and reds, there’s no better place to embrace fall than at Camp Ihduhapi. Breathe some fresh air into your workout routine and give your mind and body all the benefits the great outdoors has to offer. Camp provides a variety of beautiful, serene walking trails unique to its location. Choose from a variety of mapped-out walking paths to enjoy at any skill level. Camp Manitou is temporarily closed until mid-December. Leashed dogs are welcome and the membership ratio requirement does not apply due to being located at Wright County Park. Maps are provided at each property and includes skill level and distance information for your walking options. Each site is staffed specifically for walkers and hikers. Don't forget to swipe your membership card with the staff.